Quillan bronze turtle " Bitsy ". Signed Ltd. Ed. of 300 with 30 artist proofs. Swimming turtle, endangered species series. Approx. 3 x 3.5 x .75 inches with hand applied patina. Quillan bronze turtle "Changing Tides". Signed limited edition of 150 with 15 artist proof available. Turtle end table w/table topper. Approx. 23 x 17 x 16 inches with hand applied patina for rich finish. Quillan bronze sculpture "Chillin". Signed limited edition of 500 with 50 artist proofs available. Green shell turtle with flipper to chin. Approx. 5 x 3.5 x 2.25 inches with hand applied rich lustrous patina. Quillan bronze sculpture "Coastal Discovery". Signed limited edition of 36, artist proof available. Multiple turtles frolicking & some partially covered in sand. 14 x 10 with a hand applied blue patina. Quillan bronze turtle "Crasher". Signed limited edition of 500, artist proof available. Baby turtle hatching in egg with green shell. Approx. 5 x 4 with hand applied patina for a lustrous finish. Barry Stein turtle sculpture Daden with jewel-like Black & Purple Patina Shell. Limited Edition of 1000 pieces, approx. 6.9" l x 4.5"h. Comes to you in a luxurious soft velvet and satin embroidered bag artist signed. Barry Stein bronze turtle sculpture Daden with jewel-like Brown Patina Shell. Limited Edition of 1000 and approx. 6.9" l x 4.5"h. Comes in luxurious velvet and satin embroidered bag. Barry Stein bronze turtle sculpture Daden with jewel-like Green Patina Shell. Limited Edition of 1000 and approx. 6.9" l x 4.5"h. Comes in luxurious velvet and satin embroidered bag. 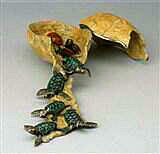 Barry Stein bronze turtle sculpture Daden with jewel like Multi - Color Patina Shell. Limited Edition of 1000 and approx. 6.9" l x 4.5"h. Comes in luxurious velvet and satin embroidered bag. Quillan bronze turtle "First Step". Signed limited edition of 700, artist proof available. Baby turtle hatching in shell with turquoise shell. 5.25 x 5 inches w/hand applied patina for a rich finish. Quillan bronze turtle "Flipper". Signed limited edition of 500, artist proof available. Baby turtle with blue and bronze patina hatching. 3 x 3 inches w/hand applied patina for a rich finish. Quillan bronze turtle "Footsteps Falling Softly". Signed limited edition of 100 with 10 artist proofs available. Turtles crawling out of an open vessel. 12"h x 4"w x 4"d. Hand applied patina for a rich lustrous finish. Quillan bronze turtle "Hatcher Treasure Box". Signed limited edition of 250 with 25 artist proofs available. 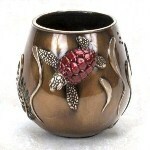 Baby turtle treasure box bronze 1.5 x 3.5 x 3.75 w/beautiful patina for a rich lustrous finish. Quillan bronze turtle "Honu Spirits". Signed limited edition of 500 with 50 artist proofs available. One sea turtle swimming in seaweed. 8"h x 6"w with hand applied patina for a rich lustrous finish. 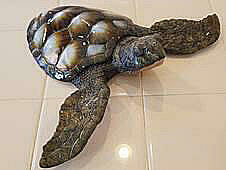 Quillan bronze turtle "Keiki Lani". Signed limited edition of 700 with 70 artist proofs available. Two turtles swimming in seaweed. 10 x 7 x 6 inches with hand applied patina for a rich lustrous finish. Quillan bronze turtle "Lil' Scooter" signed limited edition of 150 with 15 artist proofs available. Baby turtle walking across the sand. Approx. 1.5 x 5.5 x 4 inches with hand applied lustrous patina. Quillan bronze turtle "Lil' Whisper". Signed limited edition of 150. Artist proof available. Baby turtle hatching from egg with. Approx. 1.25 x 2 x 1.5 with hand applied patina for a rich lustrous finish. Quillan bronze turtle "Makin' Mischief". Signed limited edition of 89 with 9 artist proofs available. Two large sea turtles swimming. Approx. 28 x 17 x 23 with hand applied patina for a rich lustrous finish. Quillan bronze turtle "Mojave" a desert tortoise. Signed limited edition of 90 with 9 artist proofs. approximately 2.25 x 2 x .75 inches with beautiful patina for nice rich finish. Quillan bronze turtle "Moonlight Carousel". Signed limited edition of 188 with 18 artist proofs available. Three bronze turtles swimming in harmony. 10"h x 8"w x 5.5"d. Hand applied patina for a rich lustrous finish. Quillan bronze turtle "Moonlight Carousel Black". Signed limited edition of 188 with 18 artist proofs available. Three bronze turtles swimming in harmony. 10"h x 8"w x 5.5"d. Hand applied patina for a rich lustrous finish. Quillan bronze turtle "Nuzzler Treasure Box". Signed limited edition of 250 with 25 artist proofs available. Baby turtle treasure box bronze 2.5 x 2.75 x 3 inches with beautiful patina for nice rich finish. Quillan Signed Ltd. Ed. "Oceans Angels" turtle vessel. Approximately 4.5 x 5 inches with a hand applied patina for a lustrous finish. Limited to 150. Quillan bronze turtle "Palmer". Signed limited edition of 500, artist proof available. Cute baby turtle lying on back. Approx.. 3.5 x 4 x 2.5 with a nice rich hand applied patina & glossy finish, USA made. Quillan bronze turtle "Pipsqueak". Signed limited edition of 250 with25 artist proofs available. Baby turtle treasure box with beautiful turquoise and bronze colored hand applied patina. Quillan bronze sculpture "Roots of Heaven". Signed limited edition of 700 with 70 artist proofs available. Large platter with nest & 10 baby turtles hatching. 21 x 14.5 inches with a rich hand applied patina. Joseph Quillan new for 2018-2019, Safe Harbor Emerging Turtle. Large, life size, fine detailed bronze turtle, Ltd Ed. of 47 & 5 AP's. 15 x 12 x 3.5". Quillan bronze turtle sculpture "Scamper". A signed Ltd. Ed. of 750, artist proofs available. Approximately 3.5 x 3 inches with hand applied patina for a high gloss finish. Choose from four different colors. 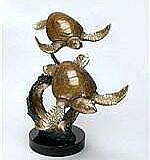 SPI Gallery, Sea Turtle Duet with Seagrass in brass and set on a marble base. Approx. 14.5"h x 13.5"w x 8"d. Turtles swim through seagrass, above reef, rock formation w/sea shells. Quillan bronze sculpture "Secret Whispers". Signed limited edition of 150, artist proof available. Large platter with nest & 10 baby turtles hatching. Approx. 21 x 14.5 inches with a rich hand applied patina. Quillan bronze turtle "Sprite" baby turtle wall hanging. Signed Ltd. Ed. of 750 with 75 artist proofs available. Approximately 5 x 5.75 inches with a rich hand applied patina for a rich lustrous finish. Quillan bronze turtle "Tipsy". Signed Ltd. Ed. of 700, artist proof available. Baby turtle, blue and bronze colors standing on it's head. 3.5 x 4 x 2.5 inches w/hand applied patina for a glossy finish. Quillan bronze turtle "Tripper". Signed limited edition of 500 with 50 artist proofs available. Baby turtle on back hatching. Approx. 4 x 3 inches with hand applied bronze patina for a rich lustrous finish. Quillan bronze sculpture "Turtle Dish". Signed limited edition of 500, artist proof available. Large platter partially covered with sand while turtles play. Approx. 14 x 10 w/hand applied rich blue patina. Quillan bronze frogss "Wherefore Art Thou" signed Ltd. Ed. of 150, artist proof available. Two colorful frogs, one red climbing a wall, the other yellow on top. Approx. 5 x 3 x 4.5 inches w/hand applied patina.